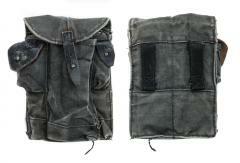 Three celled AKM magazine pouches, the next evolutionary step forward from the AK-47 type. A practical, simple and above else affordable way to carry three assault rifle magazines. Dark blue model, used by naval troops. Note: the mags shown in the photos are not included with the pouch. The AKM brought with it many changes, not only was the rifle updated, but all the extra kit was also brought up to date. 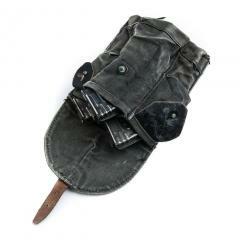 The magazine pouch got an added oiler pouch, at some point the material was also changed to that which you see here. Unlike the old AK-47 pouches, which quickly disappeared out into the world, the AKM pouch continues to see service in Russia for a long time. It probably still does, although in diminishing numbers. 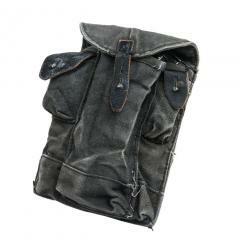 The main pouch is divided into three compartments, each fits one AK mag (7,62 or 5,45 mm). Two smaller pouches on the outside houses a cleaning kit and oiler. The backside has two 5 cm belt loops and the lower half is lightly padded to maximise the comfort of the invidiual defender of the peoples. Materials used are cotton, leather and metal knobs. Used condition, but apart from faded colours there´s nothing wrong with these, these things were built to last!